You have time and again heard me talk about investment-statement-making pieces on the blog. I am so glad to introduce you to the label DeNada which specialize in handmade knitwear for men and women. A couple of weeks back, I had the pleasure to meet Virginia Arrisueño, and checkout the Spring/Summer collection of her brand DeNada which blends the contemporary elements with traditional knitting techniques to offer unique, handmade pieces. Their new collection features light, airy, and open designs created with a cotton-blend fiber, which makes it ideal for the warmer days. To say that I fell in love with the pieces instantly would be an under statement. You might have seen me at their studios if you follow me on Snapchat ('tanviidotcom'). I loved the array of colors, and it was quite hard to pick one out of them all. You can check out a short behind-the-scenes clip here (0:53). Whenever I cannot decide, I choose color, unlike most people who would choose black, I picked the gorgeous knit shawl in a bright summer color. Beautiful yellow knit dress, i love the sandals too!! This whole combination is so gorgeous I love everything about it! Loving the color of the knit shawl! 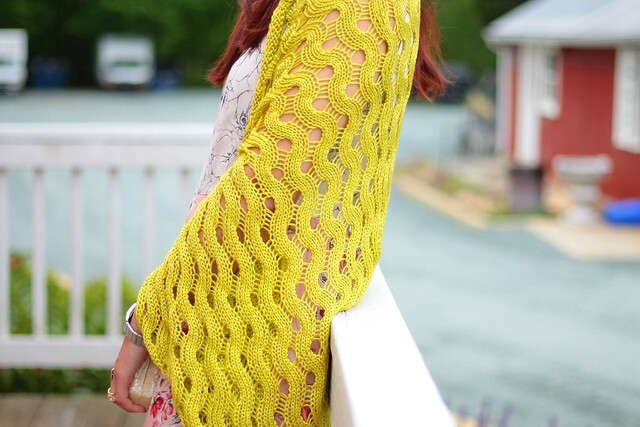 This is such a vibrant knit shawl! It's perfect for a cool, spring night! Wow! That is so beautiful! I love it with the dress and matching shoes!